You may already know Namecheap as one of the best domain registrars. But the company also offers a superior range of hosting plans for WordPress sites. It uses Softaculous installer to help you install WordPress and other necessary apps with a few clicks. The company uses latest Dell servers with redundant power supply for a reliable uptime and performance. Multi-step security measures will ensure the highest possible level of security for your websites. All hosting plans enjoy full access to cPanel for website management. The professional support team is available 24 hours a day. You can access support by using live chat or issuing a ticket. 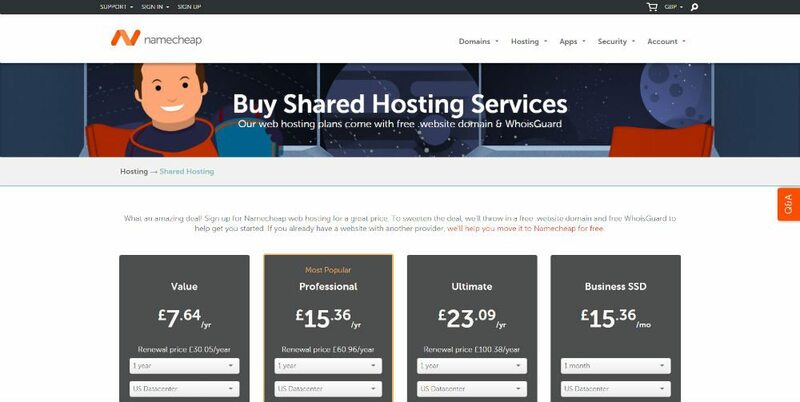 Namecheap offers a few WordPress hosting plans. All plans include unlimited bandwidth, unlimited number of parked domains, and twice weekly backups. Value has a yearly price of $38.88. It allows you to host up to three websites, 20GB of space, 50 sub-domains, and 50 FTP users. Professional is $78.88 per year, and allows ten websites, 50GB of space, 100 sub-domains and FTP users. Ultimate will cost you $129.88 per year. It includes unlimited websites, subdomains, and FTP users. The Business SSD plan is priced at $19.88 per month. It offers 20GB SSD storage, 5000GB bandwidth, twice daily backups, unlimited websites, parked domains, sub-domains, and FTP users. Monthly basis price start from $1.44 to $8.88. Features varies on the plan selected.